Manchester School of Massage has provided training in holistic therapy and alternative therapies since 1989. We offer holistic therapy courses and qualifications through the International Institute of Health and Holistic Therapies and International Institute of Sports Therapists, accredited by Vocational Training Charitable Trust. The group size is kept below ten in order to keep the course informal & friendly and ensure individual attention. We also offer holistic therapy treatments to the public by qualified staff at the Manchester Therapy Centre. We offer work experience to students who have qualified. The school is small and independent. It is centrally located with free car parking and easy access by bus or train. 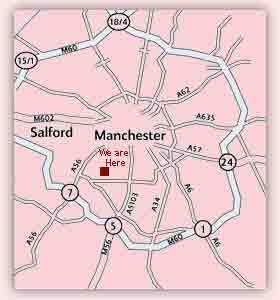 We are situated opposite the BUPA hospital in South Manchester near Chorlton. Our holistic therapy qualifications allow membership to professional bodies for insurance and licensing purposes. There is no danger of ending up with a worthless certificate from an ‘in school exam’ or through an independent examining body. Vocational Training Charitable Trust was the first awarding body in the country to offer holistic therapy qualifications. Previous students are now working in holistic therapy clinics, hospitals and self-employed from home. The FHT offers membership and insurance for students and holistic therapists. It produces a bi-monthly magazine and is there to support and assist its therapist members. Vocational Training Charitable Trust (VTCT). This is the controlling body of the International Institute of Health & Holistic Therapies and International Institute of Sports Therapists. VTCT awards are operated under a rigorous procedure of assessment and verification in accordance with NVQ rules. International Institute of Health & Holistic Therapies was created to offer qualifications in Aromatherapy & Reflexology. It has now expanded into holistic massage and other areas of holistic therapy requiring international qualifications. International Institute of Sports Therapists was formed during the 1970’s. VTCT developed qualifications in the new field of non-medical sports therapy. By 1983 they had expanded to the point where a new awarding body, I.I.S.T was formed to deal with this field. The qualifications now cover the full range of competencies required by the fitness and sports therapy industries in the UK and overseas.